IDH works with multiple partners, including technical, clinical and governmental organisations on improving safety of healthcare. Digital architectures improving patient safety. Safety analysis techniques (e.g. FMEA) for healthcare services. Assurance of complex socio-technical healthcare services. Risk assessment and balancing safety with security, performance and resilience. Interpretation of safety standards such as SCCI 0160, and ISO 13485. Failure analysis of integrated digital healthcare. 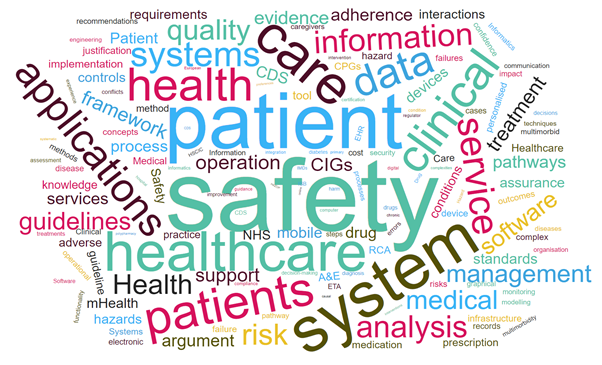 Data safety and safety of Clinical Decision Support (CDS). Safety analysis & risk assessment of health IT. The S-framework provides a lightweight and systematic way to reviewing and assuring of a service. The safety justification encapsulates and structures the analyses (such as FMEA-style analysis) that will produce the information, which will assure the safe provision of a healthcare service. Application of the framework would facilitate operators of health IT to comply with the mandatory SCCI 0160 standard. The framework identified dependencies, between the safety justification process, and clinical as well ICT staff within the organisation. This included contribution to the analyses based on their expertise, as well as provision of information that they are responsible for. The framework enables identification of risks within the healthcare service, and the means of preventing or mitigating them. Despotou G, Ryan M, Arvanitis TN, Rae AJ, Sean W, Kelly T, Jones RW, A Framework for Synthesis of Safety Justification for Digitally Enabled Healthcare Services, Digital Health Journal, vol. 3: 1-19, DOI: 10.1177/2055207617704271, SAGE. Bilici E, Lim Choi Keung SN, Despotou G, Arvanitis TN, Computer-interpretable Guidelines driven Clinical Decision Support Systems: An Approach to the Treatment Personalisation Routes of Patients with Multi-Diseases, In Proceedings of West Midlands Health Informatics Network Annual Conference, 24 January 2017. Bafhtiar G, Bodinier V, Despotou G, Elliot MT, Arvanitis TN, Bryant N, Providing Patient Home Clinical Decision Support using Off-the-shelf Cloud-based Smart Voice Recognition, In Proceedings of West Midlands Health Informatics NEtwork Annual Conference, 24 January 2017. Katzis K, Stanisopoulos S, Despotou G, Patellar Tendinopathy Rehabilitation - Wearable Device Feedback Mechanism, In Proceedings of West Midlands Health Informatics Network Annual Conference, 24 January 2017. G. Despotou, R.W. Jones, T. N. Arvanitis. Using Event Trees to Inform Quantitative Analysis of Healthcare Services. Studies in Health Technology and Informatics, 2016;226:119-22. R. W. Jones, G. Despotou. Root Cause Analysis and Health Informatics. Studies in Health Technology and Informatics, 2016;226:131-4. K. Katzis, R. W. Jones, G. Despotou. The Challenges of Balancing Safety and Security in Implantable Medical Devices. Studies in Health Technology and Informatics, 2016;226:25-8. G. Despotou and A. Stavert-Dobson. Harnessing Health IT to Address Challenges in Healthcare. In proceedings of the 2016 West Midlands Health Informatics Network (WIN), annual conference (available at: https://wmhin.org/win-annual-conference-26-january-2016/). G. Despotou, T. N. Arvanitis, S. White. Understanding and de-risking the dependencies between operator and manufacturer of clinical IT. Studies in Health Technology and Informatics, 2015; 213:197-200. G. Despotou, R.W. Jones., A.J Rae, T. Kelly. Deviation Based Safety Analysis and Justification of Clinical Services. Studies in Health technology and Informatics, 2014; 202:91-94. G. Despotou, R.W. Jones, S. White, T. Kelly. Key Issues on Assuring the Safe Operation of Health IT Systems. Studies in Health technology and Informatics, 2014; 202:205-208. G. Despotou, M. Luckcuck, T. Kelly, R. W. Jones. 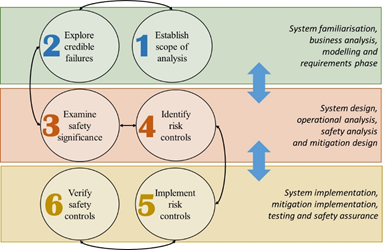 Introducing Safety Assurance Influenced Design of Health IT Systems. In proceedings of the 31st International System Safety Conference, 12-16 August 2013, Boston, MA, Proceedings by the System Safety Society.